LYA poets and friends took part in a master writing workshop run by special guest writers/ artist Calvin Made-Son Early and Arsimmer McCoy-Early from the USA Spoken Word Exchange, in collaboration with The Sunday Practise. The workshop was held at our new temporary home, The West Yorkshire Playhouse. 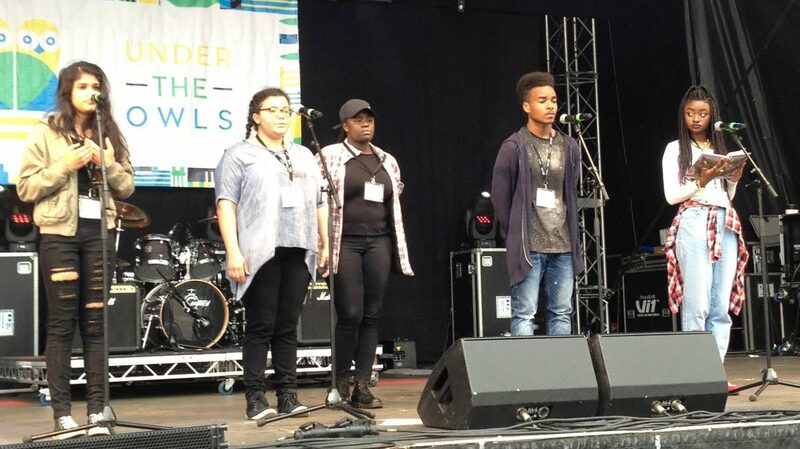 “The SPOKEN WORD EXCHANGE is an interactive creative writing project designed to inspire participants to use poetry as a tool for self discovery, empowerment, and motivation. The project gives groups of artists in various parts of the world the opportunity to experience and learn about each other’s culture, beliefs, and way of life through the art of spoken word. Our primary goal is to build a greater, more culturally aware, global community through art of poetry. This entry was posted in Blog posts and tagged Master writing workshop, Spoken Word Exchange, The Sunday Practise, West Yorkshire Playhouse. Bookmark the permalink.